If you like being spoilt for choice, Gousto may be just the kind of meal kit service you have been searching for. This service offers a rich selection of recipes every week, ranging from vegetarian delights to meals for meat-loving gourmets. In this Gousto review, we will focus on the quality of its offer, the way its subscription works, and of course, the prices. Gousto is a meal kit service that provides carnivore, pescatarian, vegetarian, plant-based, and allergen-free recipes and fresh, sustainably sourced ingredients. It allows you to cook your meals in as little as 10 minutes. If you want to order Gousto recipes and ingredients, you first need to subscribe. However, there is no need to worry about being stuck with a subscription, as the folks behind Gousto emphasize that ordering from this service comes with no strings attached. You can pause or end your subscription whenever you want. You can sign up for recurring deliveries and make additional one-off orders whenever you want. You are the one in control of your subscription. 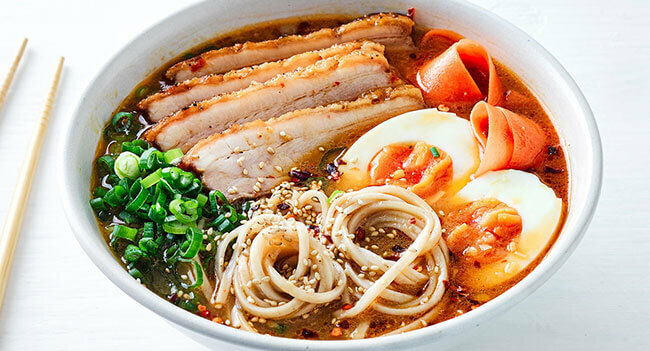 In comparison to most meal kit services, the Gousto menu boasts twice as many recipes suitable for various skill levels and dietary preferences. With this service, you can build your weekly menu with ease regardless of potential restrictions and dislikes. You can decide how many servings you want each recipe to yield and order more food when you are having guests. Finally, you can choose to spend anywhere between several minutes and a whole hour in the kitchen. 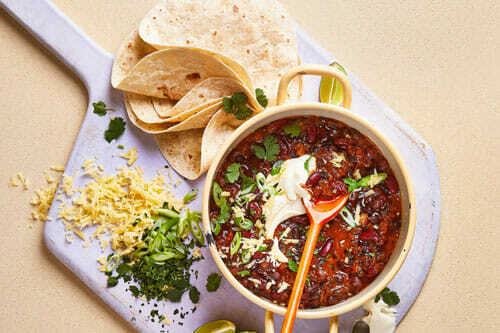 Due to the quality of its ingredients, the range of meal options it offers every week, and the level of personalization it provides, Gousto is often regarded as one of the best meal kit services in the UK. It is a simple solution for healthy eating that does not cost too much and makes cooking and meal planning easier than ever. As a Gousto subscriber, you get to choose any 2, 3 or 4 recipes from the company’s rich menu, which includes 40 recipes per week. 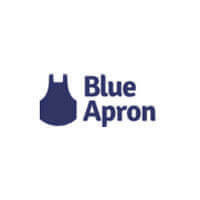 The recipes and the ingredients they call for are delivered to your doorstep every week, on the day that works for you. Gousto offers 2-Person boxes that are, as the name suggests, suitable for 2 people, and Family boxes, created to suit the dietary needs of 2 adults and 2 or 3 children, depending on their age and appetite. The portions are ample, which guarantees that the meals will satisfy the appetites of the vastest majority of customers. What is interesting to note is that you can order up to 3 boxes per week, which is not something all meal kit services offer. Furthermore, you can order the same recipe multiple times, that is, increase the amount of ingredients/number of servings, which is perfect for occasions when you are having friends over for dinner. 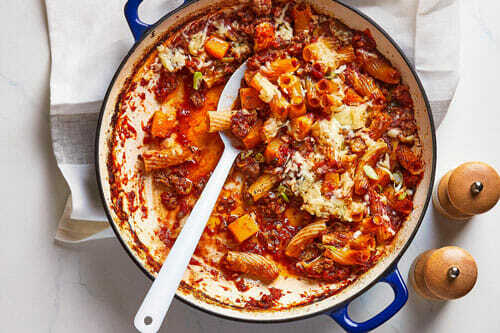 What makes Gousto a great meal kit service is the fact that it offers incredible convenience, the ultimate freshness of ingredients, creative and unique recipes, amazing variety, and wonderful flexibility, all at highly reasonable prices. It does not impose any annoying limitations and it is completely transparent about ingredient sourcing, subscription terms, and pricing, with no additional or hidden fees. 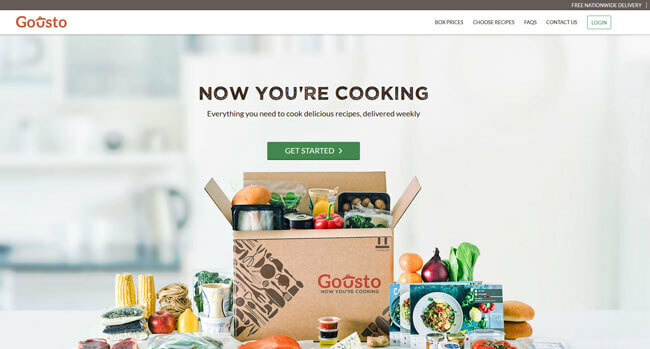 As suggested previously in this Gousto review, the service offers a greater range of recipes than most meal kit services on the market. It also pays special attention to special dietary needs, with great selections of veggie, dairy-free, and gluten-free dishes. It aims to please and does everything possible to allow you to enjoy cooking more and make it less of a chore. Previously in this Gousto review, we have mentioned that you can choose between the 2-Person and Family boxes with 2, 3 or 4 recipes. No matter which box type you choose, you can select your recipes from the same menu that includes about 40 incredible meal ideas every week. The recipes are conveniently categorized, so you can easily find what you are craving. You can opt for everyday favorites, go with the speedy, 10-minute options, view the selection of vegetarian or plant-based dishes, choose meals without gluten or dairy, explore dishes that feature fish, chicken, beef or pork or check out the company’s healthy choices. In every category, there are at least 3-4 recipes, so you have plenty of options at your disposal regardless of your current cravings or special dietary needs. Most of the meals take 10-40 minutes to make and the preparation is always simple. For every recipe, you get information on the ingredients, calorie count, amount of fats, saturated fats, carbs, sugars, fibers, proteins, and salt, as well as allergens, and you can see which cuisine the dish belongs to. Of course, just like any other meal kit company, Gousto does not deliver the essentials like oil, salt, pepper, and flour, but every recipe contains information on the basic ingredients you should have in your pantry. With Gousto, the cost of your delivery depends on the recipe box type you pick and the number of recipes you order per week. The price per serving ranges from £2.98 to £6.25. If you order more food, you pay less per serving. Shipping is always free. The 2-Person box with 2 recipes costs £24.99 (£6.25 per serving). The price of the 2-Person box with 3 recipes is £29.99 (£5 per serving). The 2-Person box with 4 recipes costs £34.99 (£4.37 per serving). Family boxes are much more affordable. The Family box with 2 recipes costs £31.75 (£3.97 per serving). The Family box with 3 recipes costs £42.75 (£3.56 per serving). The price of the Family box with 4 recipes is £47.75 (only £2.98 per serving). 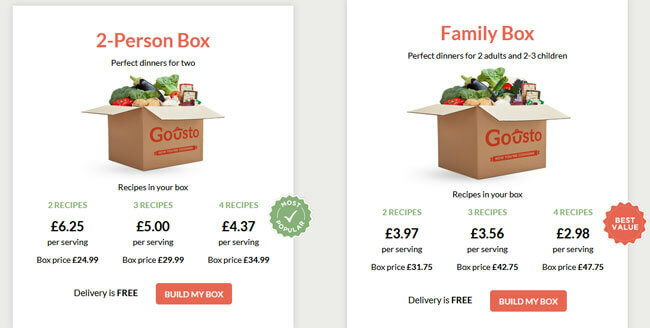 Gousto ships its recipe boxes to addresses within the mainland UK. However, even in this part of the country, there are some areas that are outside Gousto’s delivery map. The company is working on solutions that would allow it to expand its coverage. At the moment, Gousto does not ship to: AB30 – AB39, AB41 – AB45, AB51 – AB56, AB99, BT, FK18 – FK21, GY, HS1 – HS9, IM, IV1 – IV28, IV30 – IV32, IV36, IV40 – IV49, IV51 – IV56, IV63, JE, KA27 – KA28, KW1 – KW3, KW5 – KW17, PA20 – PA38, PA41 – PA49, PA60 – PA78, PA80, PH15 – PH26, PH30 – PH44, PH49 – PH50, PO30 – PO41, TR21 – TR25, and ZE1 – ZE3. On the other hand, the great news is that you can have your box delivered on any day of the week. Deliveries made between 8 am and 7 pm come with free shipping and you do not have to be at home to receive your package. In certain areas, you can choose to have your order delivered before noon or in the evening, between 6 pm and 10 pm. Such deliveries come with an additional £2.99 fee. To make sure Gousto meets all your standards and expectations, it is important to know its biggest advantages and disadvantages. With a short overview of its pros and cons, you can easily decide if Gousto is the right meal kit service for you. If you subscribe to Gousto, you can easily prepare culinary masterpieces using only the ingredients and recipes found in your meal kit box. 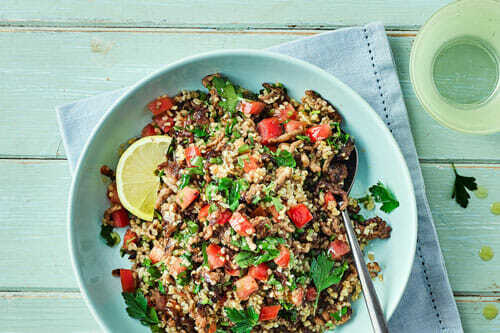 You may not be a pro chef just yet, but with Gousto, you can easily make restaurant-grade meals. You don’t have to take our word for it – check out the images below to get a better idea of the types of dishes you can enjoy with Gousto. As you may have noticed from our Gousto review, we really loved this meal delivery company. It offers a vast range of exciting recipes designed to suit different preferences and dietary needs, provides fresh, flavorful ingredients, and allows you to customize your subscription so it perfectly suits your needs and schedule. What is also important, the prices are more than reasonable and shipping is free. 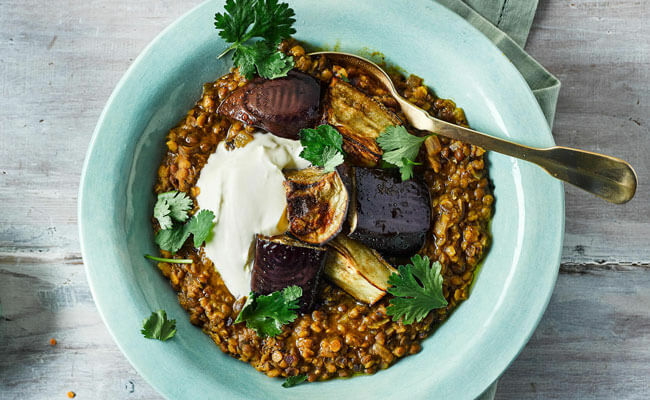 If you love cooking for yourself and your loved ones but wish it could be a bit easier and less time-consuming, Gousto can provide all the help you need without making a dent in your budget. Gousto offers a broad range of excellent recipes, delivers fresh ingredients of premium quality, and allows its patrons to customize their subscriptions according to their needs. The prices are reasonable and the company provides free shipping. You can cancel your order until noon 3 days before your delivery day. Log into your Gousto account and select the Deliveries tab to see your upcoming boxes. Choose the order you wish to cancel and click on Cancel Order. What companies are like Gousto? The top alternatives to Gousto include Mindful Chef, HelloFresh UK, Abel & Cole, and SimplyCook. What are the delivery times with Gousto? Gousto delivers to much of the mainland UK seven days a week. Subscribers can choose their preferred delivery day. Boxes arrive anywhere from 8am–7pm. In some areas, there is an option to choose morning or evening delivery. Our ratings are the result of an objective and independent evaluation of Gousto, generating the final rating that reflects the overall quality of the company. Ratings may change as the service changes. Gousto customer rating based on 10 customer reviews. I've just recently heard about Gousto and decided to give them a shot. 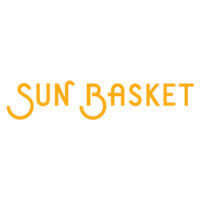 I have to say I was pleasantly surprised with the quality of service and the variety of the recipes. I especially like that I can order as much ingredients as I need. They do not limit me like other services of this kind (I was a Hello Fresh customer before discovering Gousto) and they really seem to care about their customers. Well done! Never had a problem with Gousto, and I've been a customer for almost a year now. The deliveris always arrive on time, there are no missing ingredients, and the recipes are first class! I feel like a star in the kitchen every time, really there are no words to describe just how good they are. The best on the market, I swear. Don't bother with this company. The premise is that your order meals and the ingredients arrive on a nominated day for you to make the meals. Problems arise when the box doesn't arrive. Mine was delivered to the wrong address and the company's response was that they would refund me the cost of the box (this is actually a legal obligation under Consumer Law, where you are not obliged to pay for goods or services not received) and give me some discount on a future order (risk the same experience again?)... never mind the fact that I had no food delivered for the week ahead. Their solution was that I could reorder it and it would take another 4 days to arrive. Presumably, there is no possibility of actually trying to remedy the inconvenience but replacing the lost order within 24 hours.Chose instead to cancel my membership and return to the supermarket. Would advise you not to rely on them to provide your meals. Reasonable response from Gousto. Appreciate your frustration but not sure it’s a rational action. I have only recently tried Gousto, my first delivery was great. The choice was good and portions were perfect. However my second week has not been good at all it did not turn up - it was during the snow which I understood the problems, I tracked my delivery online it did not arrive on the day of delivery but thought it would arrive the following day. It had been sent back by DPD as it was damaged. What I am annoyed about is that I have not had 1 email from Gousto about this, I emailed 3 times getting an automated response to say they will be in touch but were busy, I would not recommend due to lack of Customer care and try Hello fresh instead. Good luck with hello fresh you,ll need it i have used both Gousto and Hello Fresh in the past . Gousto customer service outshines Hello Fresh . I had a recipe box from Hello Fresh the contents were not only badly packaged and damaged Two of the ingredients to make the dishes were missing, When i finally got a response from Hello Fresh it was not helpful offering another discount does not make up for an incomplete box ,Fortunately as a retired chef i can modify a recipe to suit however most people would order a food box in order not to shop. I don't like to give people bad reviews without first giving them a chance to make it right. A very dishonest young lady knocked on my door selling Gousto food. I explained to her I am leaving the country and don't eat processed food anyway. However, as I was once a door to door salesperson in my youth I wanted to support her and ordered ONE package. I made it VERY CLEAR I DID NOT want to be put on an automatic debit and did not want anything past this first order. After many emails to you without even the courtesy of a response you are still sending me packages and still charging my card. Your last box is still sitting on the doorstep waiting for you to collect it, it has not been opened. Now you are forcing me to have to waste time going to my bank in order to stop your orders. PLEASE stop it and refund my money. Hi, I am a Gousto's customer, I would describe it as a semi-regular, as I do not order every week.. It depends on my workload. Anyway, I came across of your review and I think your review is not honest and/or possibly your have poor knowledge of what type of food is classified as processed. The food is fresh and you have to cook from scratch so it is not the Iceland type food you are trying to give up. I order only vegetarian food and all products are fresh with plenty of vegetables. The Gousto service is to deliver the customers premeasured high quality ingredients for recipes that you can choose in advance so you can have/ try the interesting food without the burden of shopping and to think what to cook. I had previously contacted Gousto by email and did not experience 'no reply'. There is also a dedicated customer phone number which I used in the past and I had no trouble to speak to anyone. As I do not order every week I can easily manage my account via the app and skip deliveries if they are not needed for the particular week. I think you might have the problem with the self- management and have trouble to sort simple things out. I can't imagine that in the 21st century you need to go to bank to deal with reccuring payment problem. Nowadays, you need to be more resourceful Internet,phone...hello? Hopefully, the food did not get processed on your doorsstep while waiting for collection. I’ve been ordering from Gousto for months now and honestly cannot imagine going back to doing everything on my own. I’ve tried a couple of services before, not going to name them now, but Gousto is the only one that really made me happy I chose it. We found 0 verified Gousto discounts for April, 2019. There are no Gousto coupons or discounts right now. If you like Gousto but aren’t sure whether they are truly the ideal choice for you, you may want to take a look at our comparisons below to discover if one of their competitors is more suitable for you.